Air Force Brig. Gen. Darren W. McDew (left) congratulates a petty officer of the Navy who received his certificate of American citizenship during a naturalization ceremony at Pritzker Military Library in Chicago. Thirty U.S. soldiers from 14 countries became citizens that day. Photo by Jason Geil. On a Friday evening in May, Bill Zhang joined 29 other U.S. soldiers for a solemn ceremony at the Pritzker Military Library in Chicago. Zhang, a construction and electrical worker for the Navy, was joined by members of the Army, Air Force, Coast Guard and Marines. Some had already seen combat in Iraq, while others, like Bill, were reservists, fitting boot camp and training into their otherwise 9-to-5 lives. But they all had one thing in common: This was their first night as American citizens. More than 39,000 soldiers have been naturalized since September 2001, according to the U.S. 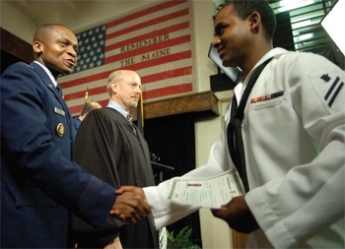 Citizenship and Immigration Services, demonstrating that many servicemen and women join the military before they are officially U.S. citizens. Overall, immigrants join the military for the same mixed bag of reasons that native-born Americans do–”a mixture of career aspiration, financial need, desire for self-improvement and patriotism. But Zhang enlisted for another reason: gratitude. Zhang, who changed his name to Bill from Bieao, came to the U.S. in 2003 with the aid of various American embassy and government officials who helped him cut through government red tape on the Chinese side. He credits these officials with reuniting him with his parents, who were already in the U.S.
Marcin Wilga, who came to the U.S. from Poland in 2001, joined the Coast Guard partly for practical reasons: He wanted education and training for a future in law enforcement. Yet he expresses the same sense of thanks and obligation that pushed Zhang to enlist. “We owe something to this country; they gave opportunity to me and my family,” said Wilga, adding that he and his sister could not have afforded to go to college in Poland. Many of the immigrants who join the armed forces do so with the intention of eventually becoming citizens. Some are still waiting out the five years of legal permanent residency that are required before they can begin the naturalization process. Once in the military, they find the process easier, thanks to the Expedited Naturalization Executive Order–”a law passed by President George W. Bush in July 2002 allowing permanent residents who have served on active duty any time since September 11, 2001, to file immediately for citizenship, even if they have not had their green cards for the full five years. But Wilga said this law is not widely publicized. “A lot of guys don’t even know that they can get citizenship through their service,” said Wilga, who found out he was eligible through Internet research. Krystof Misiura, a first lieutenant in the Army Reserves, came to the U.S. from Poland as a student in 1996 and joined the Army in 2006. After more than a decade of living in the U.S., it was his time in the military that pushed him to seek naturalization in 2008. “When you’re a soldier, you’re more strongly connected with this nation by being a U.S. citizen,” Misiura said. Perez said soldiers apply for citizenship because they want the legal rights given to Americans who have not made the same sacrifices as them.